Walter Williams and Eddie Levert first met when they were the ages of 6 and 7 respectively. As teenagers in Canton, Ohio, they formed a band originally consisting of Eddie Levert, Walter Williams, William Powell, Bobby Massey and Bill Isles. In 1963, the band took the name "The O'Jays" in tribute to Cleveland radio disc jockey Eddie O'Jay. Several members have changed, but the core, original lead singers Eddie Levert and Walter Williams, continue to front the group. In 1972, Gamble & Huff, a team of producers and songwriters with whom the O'Jays had been working for several years, signed the group to their Philadelphia International label. With this magic formula, often called The Sound of Philadelphia, The O’Jays scored the first number 1 and million-seller, “Backstabbers.” Subsequently, they succeeded with various chart-topping pop and R&B singles including “Love Train”, “Put Your Hands Together”, “For The Love of Money”, “I Love Music”, “Darlin’ Darlin’ Baby (Sweet, Tender, Love)”, “Livin’ For The Weekend” and “Use Ta Be My Girl.” This success propelled The O’Jays to be the first black vocal group to perform in arenas throughout America during the 70s and 80s. Eddie and Walter have a rare lifelong bond that few of us will ever experience; friends and partners for almost 65 years. “We still appreciate our friendship, dedication to each other and the group and our love for good music." Walter continues, "We probably could have had great solo careers, but I don't think either one of us could have ever have been as big as The O'Jays." Walter Williams could be considered a hero as he has battled Multiple Sclerosis or “MS” for 30 years and continues to execute his dance moves with perfection when performing on-stage with the group. Walter is also a volunteer National Ambassador for the MS Society and a spokesperson for MS Active Source. Eddie Levert is known for his raspy voice and has a range that takes him from alto to second tenor. Levert teamed up with his son Gerald for a duet on “Baby Hold On To Me”, which hit number one on the R&B charts. Eddie has also mentored his very successful sons Gerald and Sean who became major forces in the music industry. Eddie Levert Sr., Walter Williams Sr. and Eric Nolan Grant, who joined the group in 1995, continue to thrill fans today. 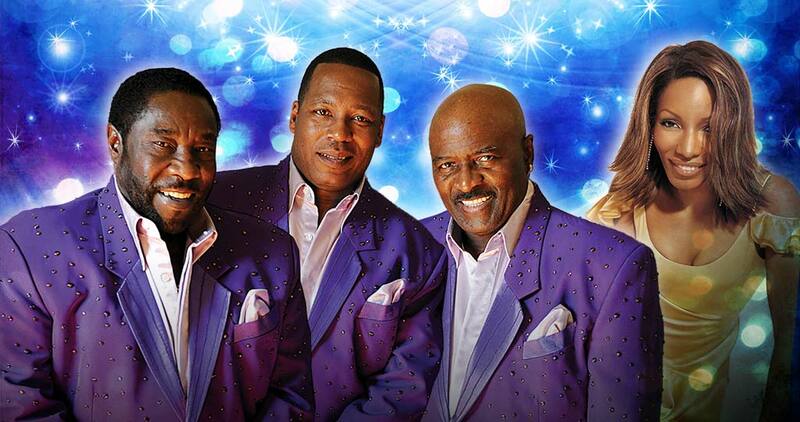 Throughout their career The O'Jays have achieved 10 Gold albums, 9 Platinum albums and 10 #1 hits. It's been a long journey but thanks to the fans the LOVE TRAIN is still going strong! VIP Package sales end June 9 at 8pm unless sold out sooner. Please note: There is no artist interaction included in this package offer. All package elements will be rendered invalid if resold. Name changes will be issued at the sole discretion of 23/7 Global. VIP instructions will be sent via email no later than three days (3) prior to the concert. If you do not receive this email three days (3) prior please email [email protected]. All packages and contents are non-transferable; no refunds or exchanges; all sales are final. All VIP package items and experiences are subject to change. Please note that the information provided at the time of purchase (e-mail and mailing address) is the same information that will be utilized for individual contact requirements where applicable. 23/7 Global, the artist, tour, promoter, ticketing company, venue or any other affiliated parties are not responsible for outdated or inaccurate information provided by the consumer at the time of purchase. If you have any questions regarding your VIP package elements, or have not received you package information within three days (3) of the concert date, please email [email protected]. METROTIX SALES END: One hour prior to show time.